Eat.Pray.Travel.Teach. : Read Your Heart Out! It's that time of the year! A Seuss filled week of engaging activities. I love this time of year because I love promoting literacy! 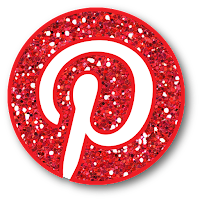 Now, if you are looking for activities on TPT, it may be hard to find. That's why I turn to Pinterest, the internet and other teachers. 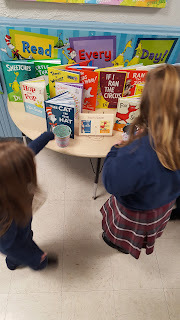 Click below to go to my Pinterest board for Dr. Seuss ideas. Tuesday we are having guest readers coming in to read Green Eggs and Ham. So the kids will be wearing green tshirts along with a Dr. Seuss hat I have for them. For snack we will be having green eggs! Then at the end of the day we will be making green slime using borax. Wednesday we are wearing crazy sock fort Fox in Socks. We will also be completing a fish graph with colored goldfish. Learning is certainly a little more fun when you can eat it after! Thursday we are dressing Wacky for Wacky Wednesday. Yes, we're doing it on Thursday - how wacky is that? In the past we have had the kids design their own Dr. Seuss hat. There were some GREAT ideas. We held it as a contest for the whole school. The older kids were really into it. That could be a perfect Art project for your older kids on Friday. In the past I have made a giant batch of Oobleck. This year we are skipping it and making the green slime. Now, what I am really excited for this week! HOW COOL!!! I got the original idea here, from The Brown Bag Teacher. I decided to use Dr. Seuss books because I already had a mini bulletin board set that came with 12 book covers. You can see that the B&W ones are the ones I included. Now, the board does not look exactly like this any longer. I switched Fox in Socks with There's a Wocket in my Pocket because the paired up a better, in my opinion. This board is huge! I was very fortunate to have 3 other colleagues help me put it up! The students are very excited for it. I am having older students come down and read the books on the left to my students. They are all loving that! And it is helping the older kids with public speaking skills. So the board is based off of March Madness. It starts with the sweet 16. Two books will battle and one will advance. All books compete in the sweet 16 until we get to the elite 8. From there we will have our final 4. 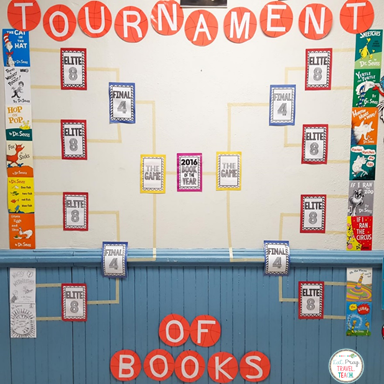 The Game will have the top book from each side going up in the Championship game until we discover the favorite Dr.Seuss book! I will be reading of the books to the kids, but the other grades may chose not to. For example, you could also watch the animated videos for some of the books! Or assign them for a homework assignment for your older kids. So many ideas! I picked up Dr. Seuss' last book, What Pet Should I Get? and I can't wait to read it! 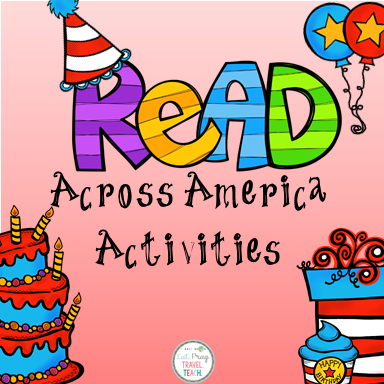 Check out below for more ideas for activities with read alouds. Looking for even more ideas? Jump over to the Primary Pack! They all have a great post for you. I hope you read a lot and have an amazing literacy filled week!! !